La hiperglucemia inducida por glucocorticoides es un escenario frecuente al cual se enfrenta el clínico durante su práctica hospitalaria diaria, constituyendo un reto en el abordaje y control del estado metabólico de estos pacientes, con el fin de disminuir su morbimortalidad asociada. Presentamos el caso clínico de una paciente de género femenino de 69 años con antecedente de diabetes mellitus tipo 2 y linfoma no Hodgkin, hospitalizada para inicio de ciclo quimioterapéutico, durante el cual se documentan hiperglucemias sostenidas de difícil manejo. La paciente recibió tratamiento con esquema basalbolo y un bolo adicional de insulina NPH titulado según las dosis y tipo de glucocorticoide aplicado, alcanzando adecuado control metabólico. Se realiza una revisión de la literatura respecto a la hiperglucemia inducida por glucocorticoides, su abordaje y tratamiento, y las recomendaciones existentes en cuanto al uso de insulina NPH como esquema adicional correctivo. Fellow Endocrinología Fundación Universitaria de Ciencias de la Salud. 1. Huelgas R. Glucocorticoid-induced hyperglycemia. Journal of Diabetes 6 (2014) 9-20. 2. Van Staa TP, Leufkens HGM, Abenhaim L, Begaud B, Zhang B, Cooper C. Use or oral corticosteroids in the United Kingdom. QJ Med. 2000; 93:105-11. 3. Bressler P, De Fonzo RA. Drugs and diabtes. Diabetes Rev.1994; 2: 53-84. 4. Tatsuno I, Sugiyama T. Glucocorticoides-induced diabetes mellitus is a risk for vertebral fracture during glucocorticoid treatment. Diabetes Res Clin Pract. 2011; 93: e18-e20. 5. Rowbottom, Leigha, Stinson, Jordan, McDonlad, Rachel, et al. Retrospective review of the incidence of onitoring blood glucose levels in patients receiving corticosteroids with systemic anticancer therapy. Ann Palliat Med 2015:44(2); 70-77. 6. Donihi AC, Raval D, Saul M, Korykowski MT, De Vita MA. Prevalence and predictors of corticosteroids-related hyperglycemia in hospitalized patients. Endocr Pract. 2006;12: 358-62. 7. Raalte DH, Diamant M. Steroids Diabetes: from mechanical to treatment? The Netherlands Journal of Medicine 2014; 72:2. 8. Sudlow A, O’Connor HM, Narwani V, Swafe L, Dhatariya K. Assessing the prevalence of dexamethasone use in patients undergoing surgery, and subsequent glucose measurements: a retrospective cohort study. Pract Diab 2017; 34(4):117-121. 9. Montori VM, Velosa JA, Basu A et al. Posttrasplantation diabetes: A systematic review of the literature. Diabetes Care. 2002;25: 583-92. 10. Gunar T, Jan B, Goran S et al. Improvement survival in patients with insulin dependent diabetes mellitus and end-state diabetic nephropathy 10 years after combined pancreas and kidney transplantation1. Transplantation. 1999; 67:5: 645-648. 11. Umpierrez GE, Isaacs SD, Bazargan N, You X, Thaler LM, Kitabchi AE. Hyperglycemica: an independent marker of inhospital mortality in patients with undiagnosed diabetes. J Clin Endocrinol Metab.2002;87:978-982. 12. Ingle DJ. Production of glycosuria In normal rat by means of 17-hydroxy11-dehydrocorticosterone. Endocrinology 1941; 29:649-52. 13. McMahonM, Gerich J, Rizza R. Effects of glucocorticoids on carbohydrate metabolism. Diabetes Metab Rev. 1988;4: 17-30. 14. Vegiopoulos A, Herzig S. Glucocorticoids, metabolism and metabolic diseases. Mol Cell Endocrinol. 2007; 275:43-61. 15. Van Raalte DH, Ouwens DM, Diamant M. Novel insights into glucocorticoidmediated diabetogenic effects: Towards expansion of therapeuthic options? Eur J Clin Invest. 2009; 39:81-93. 16. Corssmit EP, Romijn JA, Sauerwein HP. Regulation of glucose production with special attention to nonclassical regulatory mechanisms: A review. Metabolism 2014; 50(7):742-755. 17. Boden G. Gluconeogenesis and glycogenolysis in health and diabetes. J Investig Med 2004; 52(6):375-378. 18. Van de Werve G, Jeanrenaud B. Liver glycogen metabolism: An overview. Diabetes Metab Rev 1987; 3(1):47-78. 19. Gerich JE, Lorenzi M, Bier DM et al. Effects of physiologic levels of glucagon and growth hormone on human carbohydrate and lipid metabolism. Studies involving administration of exogenous hormone during suppression of endogenous hormone secretion with somatostatin. J Clin Invest 1976; 57(4):875-884. 20. Rizza RA, Mandarino LJ, Gerich JE. Dose-response characteristics for effects of insulin on production and utilization of glucose in man. Am J Physiol Endocrinol Metab 1981; 240(6):E630-E639. 21. Dungan KM, Braithwaite SS, Preiser J-C. Stress hyperglycaemia. Lancet 2009; 373(9677):1798-1807. 22. McCowen KC, Malhotra A, Bistrian BR. Stress-induced hyperglycemia. Crit Care Clin 2001; 17(1):107-124. 23. Stentz FB, Umpierrez GE, Cuervo R, Kitabchi AE. Proinflammatory cytokines, markers of cardiovascular risks, oxidative stress, and lipid peroxidation in patients with hyperglycemic crises. Diabetes 2004; 53(8):2079-2086. 24. Chaudhuri A, Umpierrez GE. Oxidative stress and inflammation in hyperglycemic crises and resolution with insulin: implications for the acute and chronic complications of hyperglycemia. J Diabetes Complications 2004; 26(4):257-258. 25. Reyes-Umpierrez D, Davis G, Cardona S et al. Inflammation and oxidative stress in cardiac surgery patients treated to intensive versus conservative glucose targets. 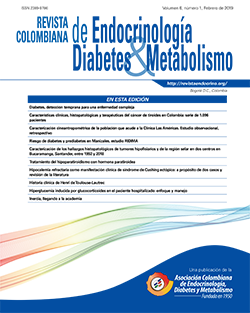 J Clin Endocrinol Metab 2016; 102(1):309-315. 26. Riddle MC, et al. Standards of medical care in diabetes-2018. American diabetes association. The Journal of clinical and Applied Research and education. 2018;41; s144-151. 27. Moghissi ES, Korytkowski M, DiNardo M, et al. ; American Association of Clinical Endocrinologists; American Diabetes Association. American Association of Clinical Endocrinologist and American Diabetes Association consensus statement on inpatients glycemic control. Diabetes Care 2009; 32: 1119-1131. 28. Institute of Medicine. Preventing Medication Errors. Aspden P, Wolcott J, Bootman JL, Cronewett LR, Eds. Washington, DC, The National Academies Press, 2007. 29. Wang YJ, Seggelke S, Hawkins RM, et al. Impact of glucose management team on outcomes of hospitalizaron in patients with type 2 diabetes admitted to the medical service. Endocr Pract 2016; 22:1401-1405. 30. International Hypoglycaemia Study Group. Glucose concentrations of less than 3.0 mmol/L (54 mg/dL) should be reported in clinical trials: a join position statement of the American Diabetes Association and European Association for the Study of Diabetes. Diabetes Care 2017; 40: 155-157. 31. Clore J, Thurby-Hay L. Glucocorticoid-induced hyperglycemia. Endocr Pract 2009;15:469-74. 32. Kwon S, Hermayer KL. Glucocorticoidinduced hyperglycemia. Am J Med Sci 2013;345: 274–277. 34. Trence DL. Management of patients on chronic glucocorticoid therapy: an endocrine perspective. Prim Care 2003; 30:593-605. 35. Campbell PJ, Gerich JE. Impact of obesity on insulin action in volunteers with normal glucose tolerance: demonstration of a threshold for the adverse effect of obesity. J Clin Endocrinol Metab 1990; 70:1114-18. 36. Maynard G, Wesorick DH, O´Malley C, Inzucchi SE; Society of Hospital Medicine Glycemic Contorl task Force. Subcutaneous insulin order sets and protocols: effective design and implementation strategies. J Hosp Med 2008; 3 (Suppl. ): 29-41. 37. Corsino L, Dhatariya K, Umpierrez G. Management of diabetes and hyperglycemia in hospitalized patients. In Endotext [Internet]. Available from http://www.ncbi.nlm.nih.gov/books/NBK279093/ Consultado el 28 de octubre de 2018. 38. Kwon S, Hermayer KL. Glucocorticoid-induced hyperglycemia. Am J Med Sci 2013; 345: 274-277. 39. Brady V, Thosani S, Zhou S, Bassett R, Busaidy NL, Lavis V. Safe and effective dosing of basal-bolus insulin in patients receiving high-dose steroids for hyper-cyclophosphamide, doxorubicin, vincristine, and dexamethasone chemotherapy. Diabetes Technol Ther 2014; 16: 874-879. 40. Xiao-xia L, Xiao-Ging Z, Qing M et al. Hyperglycemia induced by glucocorticoids in non-diabetic patients: A Meta-Analysis. Ann Nutr Metab. 2014; 65: 324-332. 41. Lhakani OJ, Kumar S, Triphati S, et al. Comparison of two protocols in the management of glucocorticoid-induced hyperglycemia among hospitalized patients. Indian Journal of Endocrinology and Metabolism. 2017;21,6:836-844. 42. Umpierrez GE, Hellman R, Korytkowski MT, et al. Management of hyperglycemia in hospitalized patients in non-critical care setting: an endocrine society clinical practice guideline. J Clin Endocrinol Metab. 2012; 97:16-38. 43. Hawkins K, Donihi AC, Korytkowaski MT. Glycemic management in medical and surgical patients in the non-ICU settings. Curr Diab Rep 2013; 13:96–106. 44. Najman A, Andre K, Gorin NC: [Influence of comorbidities on decision caring of malignant haematological diseases]. Bull Cancer 2009; 96:563-570. 45. Paulsen Ø, Aass N, Kaasa S, et al. Do corticosteroids provide analgesic effects in cancer patients? A systematic literature reviews. J Pain Symptom Manage 2013; 46:96-105. 46. Roscoe JA, Heckler CE, Morrow GR, et al. Prevention of delayed nausea: A University of Rochester Cancer Center Community Clinical Oncology Program study of patients receiving chemotherapy. J Clin Oncol 2012; 30:3389-3395. 47. Brady V, Thosani S, Zhou S, Bassett R, Busaidy NL, Lavis V. Safe and effective dosing of basal-bolus insulin in patients receiving high-dose steroids for hyper-cyclophosphamide, doxorubicin, vincristine, and dexamethasone chemotherapy. Diabetes Technol Ther 2014; 16: 874-879. Diabetes Technol Ther 2014; 16: 874-879.